Caregiving is a demanding task that takes a huge toll on the person providing care—mentally, emotionally, physically, and spiritually. Nell Noonan, speaking from her own experience as caregiver for her husband, describes caregiving as a "cataclysmic spiritual experience." She says it's critical for caregivers to practice self-care so they can cope with their situation. Paying attention to one's spiritual health is especially important. The 28 Days format (4 weeks of brief daily readings that include scripture and prayer) provides an accessible way for caregivers, typically stressed and pressed for time, to devote a few minutes to their spiritual health. Noonan's honesty and faith are hallmarks of her writing. Speaking from her own experience and the experiences of others, she does not avoid difficult situations and the feelings that accompany them. Noonan witnesses to the strength she finds as she continually turns to God, even in her darkest moments. Caregivers will appreciate these devotions that are both forthright and uplifting. 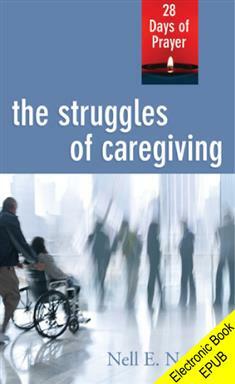 This book makes a thoughtful gift for any caregiver or for staff members of a facility for older adults.